The bizarre Raukar (Sea Stacks) at the Langhammars natural reserve at the coast of the Baltic Sea below a blue sky with some clouds. 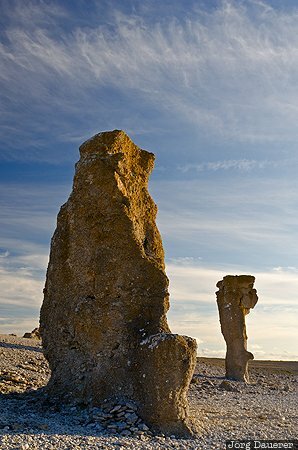 The Langhammars natural reserve is on the island Fårö north of Gotland in the south of Sweden. This photo was taken in the evening of a sunny day in August of 2014. This photo was taken with a digital camera.